I bought this palette shortly after my MAC shopping. I was going to review this blush after reviewing all MAC products but I still haven’t finished them all, still left with MAC Fix+ (which I will review soon). But having used this blush a number of times and being thoroughly impressed, couldn’t resist myself prioritizing its review. 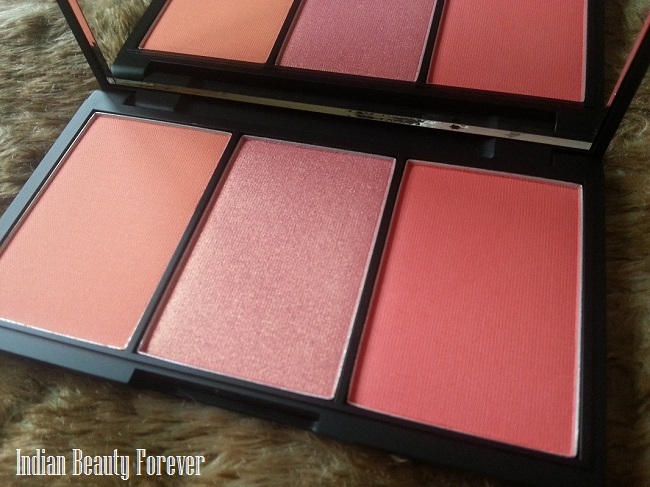 · The ultimate blush palette with 3 complementary shades in one mirrored compact. · Layer the varying finishes for greater intensity, or apply alone for a burst of full-on pigmentation. · The versatile shimmer shades can be used to highlight areas of the face that naturally catch the light for a luminous finish. 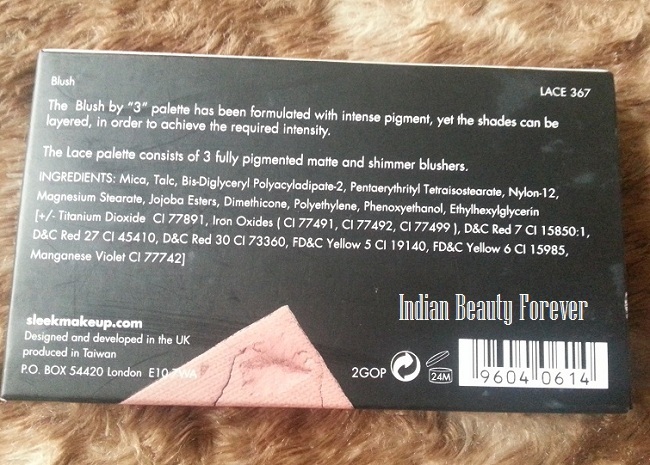 It is one of the gorgeous blush palettes which is a mix of matte n shimmer shades. It comes in a great variety but I chose Lace 367 which has two mattes Crochet & Chantilly and one highly shimmer Guipure. Crochet is a soft orange/peachy/coral pretty shade which gives very light, natural and flawless effect to cheeks. Guipure is a shimmery peach/pink with gold flecks and can be used as a highlighter and brings out glow on face with its smooth and silky texture. Chantilly is a rosey pink shade which would suit medium to fair skin tones. Both matte colours can be used anytime but shimmer one looks good at evening parties or night out. Personally I love the shimmer one a lot. It is highly pigmented and would suit all skin tones. The colours are so intense you should be very careful while applying on the cheeks. A light hand and fluffy blush should be used and you don’t need too much product, just one swirl of brush is enough for the natural colour on cheeks. It stays longer as well around 7 tor 8 hours but for oily skin beauties it stays around 3 or 4 hours. It comes in a very sleek, classy black satin plastic case which is very compact in size and sturdy too for carrying around in purse while travelling. It has a full mirror which can be used for various purposes and very handy to apply or do touch ups. All three shades are equally divided. 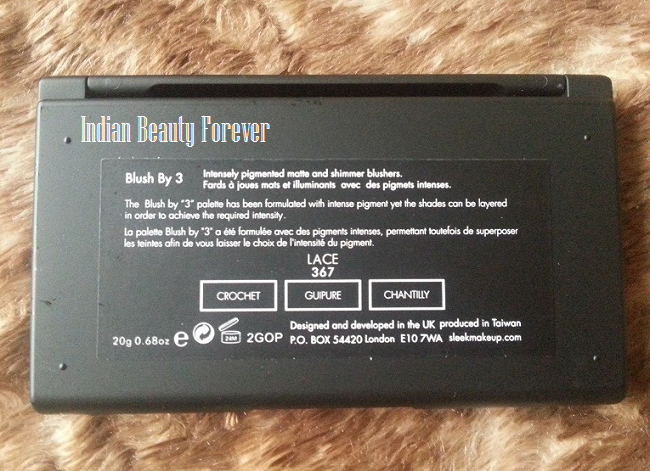 All ingredients are listed on back side of the palette’s outer cover together with Blush name n number. Brand name is embossed over the top of the case. At £9.99 you get pretty large blushes of amazing quality. 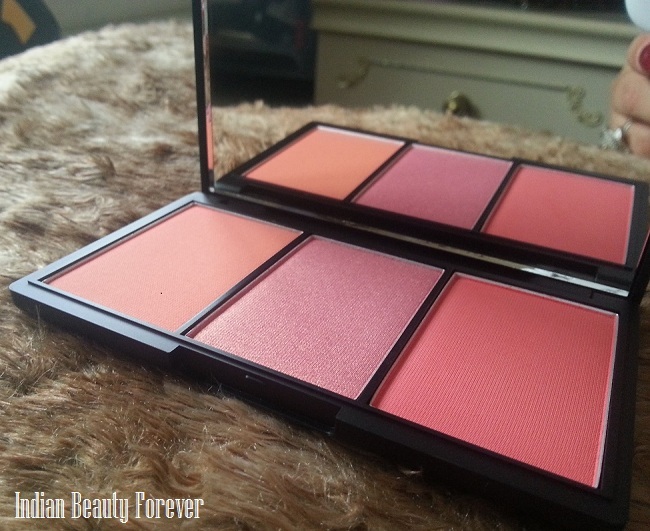 This palette is for those who love bright orange n coral tones. The texture is very creamy n buttery although the two matte shades are little powdery as well which was evident when I swirl the brush over to see some powder scattering. I have used peach n pink shades almost every day. 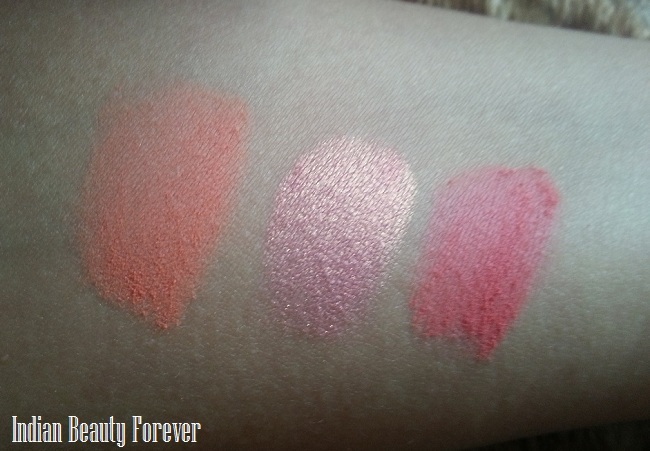 The shimmery shade (guipure) contains fine glitters which can be used over the top of other blushers as a highlighter. So the blush palette can be used as a regular or for a dramatic look. This is my first sleek blush and I am quite happy with it; would love to buy more! I am wearing Chantilly for this look! I am a huge fan of sleek makeup and this is definitely a must have palette. 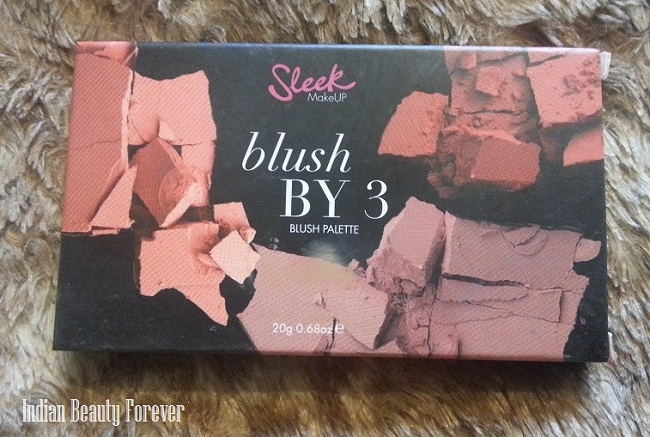 The blush palette is amazing, very compact and travel friendly. It is really good in terms of pigmentation, texture and staying power. Ideal for spring /summer! Do give it a shot if you love vibrant shades. Lovely review Tej! These are super awesome colours and looks uper duper chic on you! 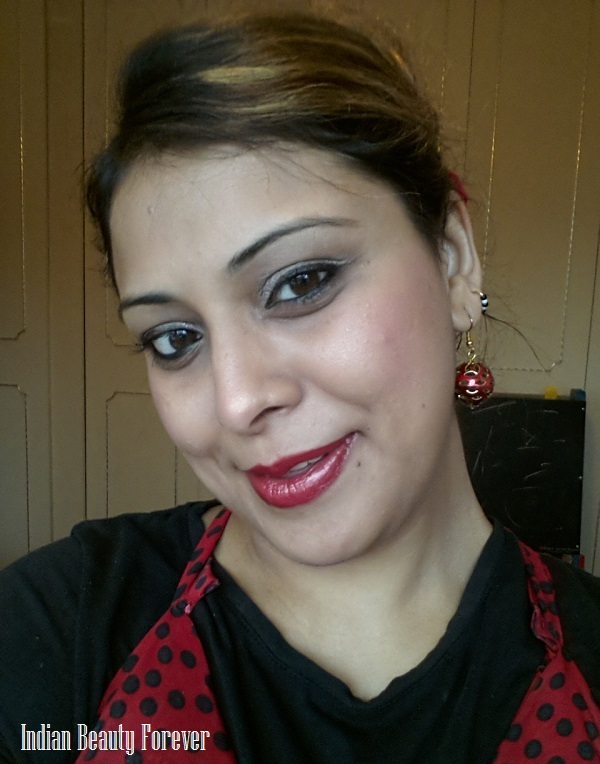 Indeed it's a lovely palette. .
lovely shades.. Nice FOTD Tej :) I so want to try this blush palette. all the 3 shades are really beautiful. very well reviewed. 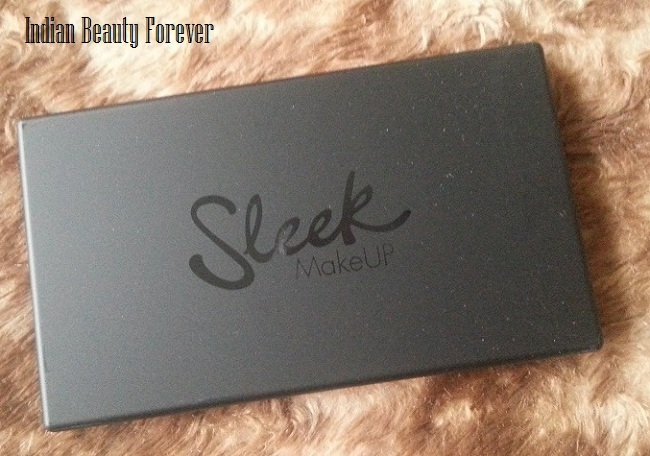 Nice review dear :) love sleek.. I want htis blush palette! all the 3 colors are awesome! You look lovely TEJ. Seeing your smiling and happy face always puts a smile on my face. Stay blessed. this is my friend niesha's blog...thank you soo much for dropping by..
That middle shade looks so much like Rose Gold I reviewed.....Is it the same Tej? no richa they r nt similar..but both r shimmery n can be used as a highlighter..
Nice review Tejinder! these shades looks very good on you!!! As soon as I saw the pic of this blush, I was really tempted and when I saw your pic, me toh is blush pe fida hi ho gayi after seeing you wearing it. You are looking so cute in the pic di, lovely review as usual..
Lovely palette!!! You are , always, so professional in your reviews Tej... great job!!!! Tnx for your comment on my last post,<3!!!!! Been wanting to get this for a while now. Nice colours. That's my favorite shade too.. Aww..Thank you soo much Rashmi n I like ur mac collection. .
Hi dear Tej =) I' a big fan of Sleek too, I really like their products, especially the Eyeshadow Palettes !!! loved the palette. and you look amazing as usual. :) i guess even prettier. I like that simmering bronze. Its perfect for a natural shade on the cheeks. Price has never been an issue for me because its about product satisfaction. Yeah its expensive for some ppl but totally worth the money as three shades in one palette..
Di u r looking absolutely stunning! Loved the blush! Good to hear you love it too because I sure do! For me I don't think its expensive at all when maybelline and l'oreal sell one blush for $15 USD here! It's crazy! They all look great on your skin tone! It's expensive for some ppl dear but totally worth the price.. In 10 pounds 3 blush..nt bad..
Haan re availability is definitely an issue..